From record breaking performances to interesting fashion choices, (see Niceville Throwers and Rickards Boys Sprinters), the Seahawk Open was a meet for the books, with the Niceville Boys and Girls teams each claiming the 1st place trophy. Thirteen teams competed for the title, with Niceville's girls outscoring 2nd place Pine Forest 147 to 129. Fort Walton Beach claimed 3rd with 110 points and South Walton was 4th with 75. On the boy's side Niceville scored 160 points to host South Walton's 126, Fort Walton Beach was 3rd with 99 and Rickards 4th with 75 points. 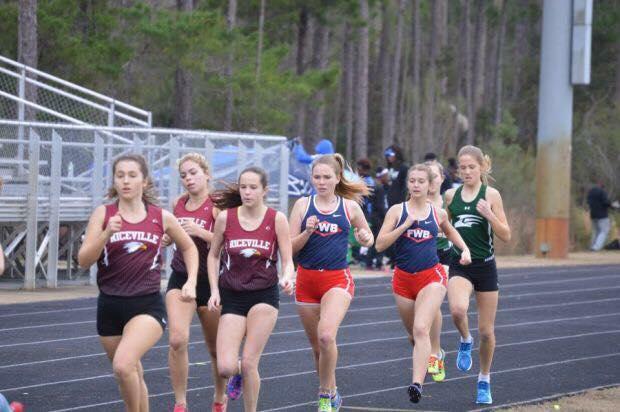 The day kicked off with dominant wins in the 3200m from Arnold's Marisa Ashley with a time of 11:43 and on the boys side South Walton's Logan Brooks cruised to the win in 10:16. Also noteworthy on the day was the camaraderie of the Niceville throwers, which was evidenced not only in their vocal support of each other but with their across the board success. Recent University of Charleston football signee Elijah West displayed his multi-sport prowess in winning both the discus and shot put with respective throws of 46.62m and 16.03. Teammate Nash Rutledge took 2nd in discus and 7th in shot, and Max Warnecke claimed 5th in discus, with Ryan Sabin placing 5th in shot put. On the girl's side, Chloe Hill, Mariah Carruthers, and Caitlyn Stringfellow went 1-2-4 in the discus. They also scored points in the shot put with Hill taking 3rd and Stringfellow, Sydney Greene, and Ryan Giordano going 5-6-8 to contribute to the team points. With multiple scoring performances in every event, Niceville's depth in the field events was further highlighted by the performances of Kobe Babin and Madalyn Kish. Sophomore Babin won the boys pole vault and Kish, a junior, motivated by her recent unofficial visit to the University of Miami, won the High Jump and took 3rd in the pole vault. Host team South Walton High School competed well, with their boys claiming each of the 800m, 1600m, and 3200m distance titles. Coming in, having competed in the indoor season at meets including the Arkansas High School Invitational and the Vanderbilt High School Invitational, they were well prepared to dominate, and they did. Sophomore Jacob D'Aleo ran an outstanding 800m, winning it with a 2:01.38. Recent Flagler signee Connor Norton cruised to a win in the 1600m with a time of 4:46.23, well clear of Niceville's underclassmen, sophomore Jake Dever and freshman Todd Wendel who worked together to finish in 4:53.52 and 4:53.92 respectively. South Walton also had great performances from the sibling duo of Anthony Bryan and Patasha Bryan. Anthony proved why he is the top ranked junior decathlete nationally, winning the long jump in 6.46m and the 110m hurdles in 15.31. His freshman sister, Patasha, took 2nd in the high jump. There were several other noteworthy performances, including those of the overall point champion for the day, Pine Forest's Koriyunna Arrington. Amazingly, only a recent competitor in hurdles events, she swept the girls 100 and 300 meter hurdles, then anchored the winning 4X400 meter relay. Adding a bronze medal to her 3 golds, Koriyunna anchored the Pine Forest girl's 4X100 meter relay to a 3rd place finish. To cap off an eventful day, the Rickards boys fended off a challenge from South Walton in the 4X400 meter relay, and earned a stadium record of 3:21:10 for their efforts.